Hey, Jim, all these stoves are all well and fine, but what about sustainability? Well, good question. Petroleum based fuels are great, but in no way are they sustainable. However, there are a couple of fuels out there that are considered "green:" alcohol and biodiesel. Now, some people will be thinking "what about wood?" Wood is a sustainable fuel, but in heavily traveled areas, the forest can be picked clean of downed wood, and people will start pulling down standing wood -- hardly a "green" practice. So, for the purposes of this post, I'm going to talk about fuels that you bring, i.e. a substance that you bring with you and burn to cook with in order to minimize your impact on the environment and Leave No Trace. First, alcohol: Alcohol stoves have been around for years. The good news is that alcohol stoves will burn "green" alcohol just fine without any modifications. In other words, the only thing you need to change if you've already got an alcohol stove is just your brand of alcohol. Sweet! Um, that's great, but just what is "green" alcohol? Well, "green" alcohol is primarily ethanol (ethyl alcohol) that has been made in a sustainable fashion. 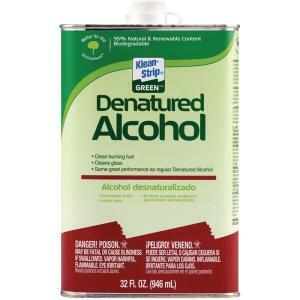 Generally, "green" alcohol has a higher ethanol content that "regular" denatured alcohol. For example, "regular" Klean Strip SLX brand denatured alcohol is 45-50% ethanol, 50-55% methanol, 1-4% Methyl isobutyl ketone according to its MSDS. In other words, the primary component is methanol. Methanol is typically made from methane (natural gas), a fossil fuel -- hardly a sustainable product. On the other hand "green" Klean Strip brand denatured alcohol is Ethanol 90-100%, methanol <10%, Methyl isobutyl ketone <10%, Acetic acid, Ethyl ester <5%. There's a lot more sustainable ethanol, and there is far less unsustainable methanol. Perfect? No, but much better than SLX's regular product and far better than a 100% petroleum product. Now, let's talk about biodiesel. First, I am not an expert on biodiesel. But I'm getting enough questions about biodiesel that I though I'd at least post some general information based on the questions I've received. A: Maybe. But it probably won't work very well, if at all. Biodiesel is pretty heavy. Stoves tend to foul and jam a lot on biodiesel. Something like an XGK (about as robust a stove as you can find) would be your best bet, but I would test it thoroughly at home before taking it out on the trail. No backpacking stove that I know of is designed for biodiesel. I would definitely not try biodiesel in a stove with a valve at the burner. Stoves with a valve at the burner tend to be more "sensitive" to fuel impurities. Examples of stoves with a valve at the burner include the MSR Dragonfly, the Primus Omnifuel, the Coleman Apex II, and the Optimus Nova/Nova+. Q: Can I run an alcohol stove (aka a meths stove) on biodiesel? A: No way. You're just not going to get enough thermal feedback (enough heat) in a typical alcohol stove to vaporize a heavy fuel like biodiesel. The take away from all this is that if you're going to try biodiesel in a backpacking type stove, it's going to be a rough go. If I hear of a stove that works well with biodiesel, I will post an update. In the mean time, if you want to go "green," get yourself a nice alcohol stove.